We are witnessing a moment of unprecedented political engagement and social activism. Pundits once fretted about Americans’ apathy, but in the last few years we’ve seen uprisings and protests across the country: the growth of the Tea Party, the successful fight for a $15 minimum wage, Black Lives Matter, Occupy, and the grassroots networks supporting presidential candidates like Bernie Sanders. 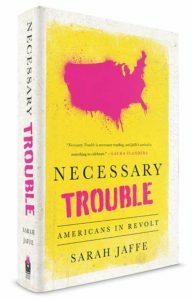 In Necessary Trouble, journalist Sarah Jaffe leads readers into the heart of these movements, explaining what has made ordinary Americans from Seattle to St. Louis to Atlanta become activists. As Jaffe shows, Americans, regardless of political alignment, are boldly challenging who wields power in this country. They are poised to permanently remake politics as we know it—and in many cases, they already have.